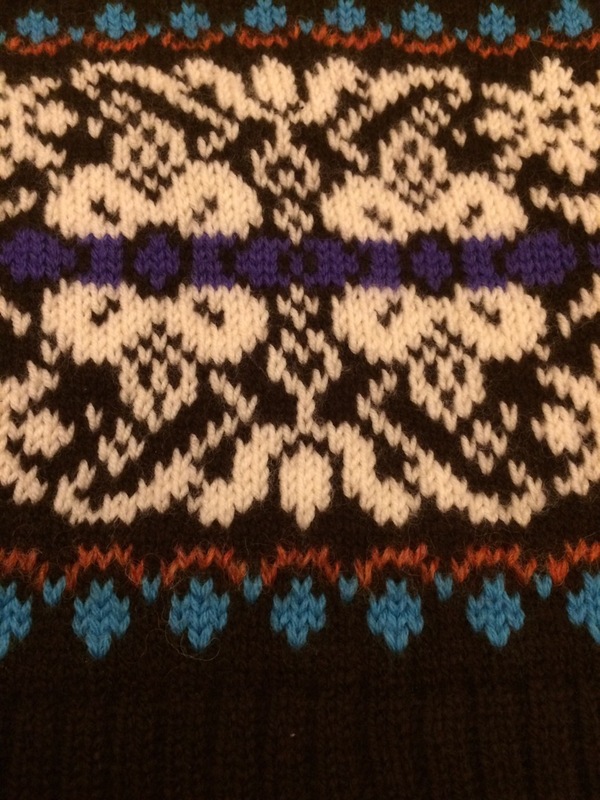 A blog about knitting and other things…. Thank you Barbara, its great to hear your feedback. This was a talk that I gave at the Textile Institute. In it I discussed seamless knitting technologies, their historical roots in hand knitting methods, and the potential the ‘new’ technolgies are bringing to commerical knitwear and knitted outputs. The audience had the opportunity to handle samples produced on flat-bed Shima Seiki Wholegarment and Santoni circular seamless machinery. This was in 2014, and since then mass produced knitted footwear of varying degrees of sophistication has become common on the high street (and it is so comfortable). I recently purchased a pair of hi-top elastic knit trainers, with flechage (short row) shaping on the ankle and other technical knit structures on the upper and toe, for a very moderate sum. In 2014 they were still expensive and quite exclusive – so we can see the impact on footwear without looking further than the high street (or online shopping of course). I recently heard of a business in the US that knits custom made climbing boot uppers, fascinating! Follow this link to my media page to read more about the talk. 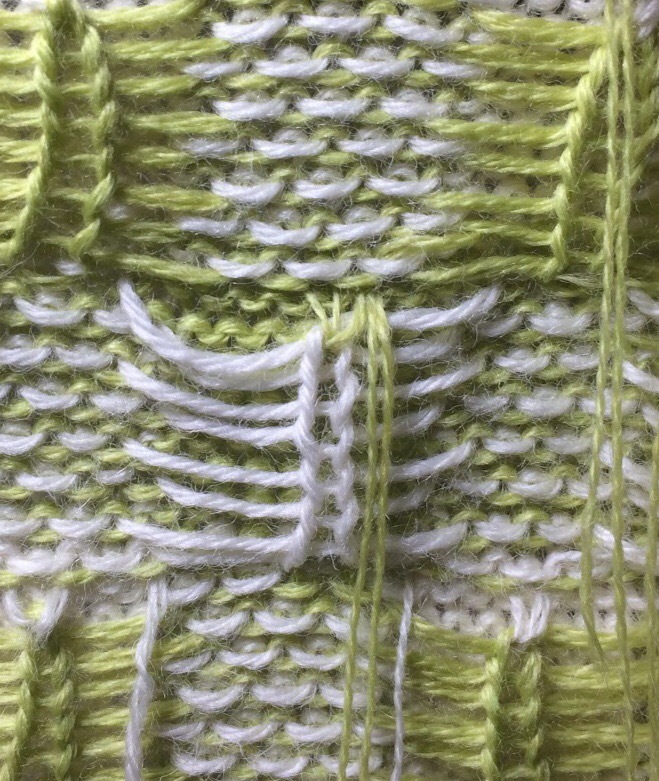 What’s inside ‘Translating Between Hand and Machine Knitting’? Lace knitting – see more about this on my Translating Between Hand and Machine Knitting page, but in brief, yes this is explained in loads of detail, with helpful photos and diagrams, examples and step-by-step instructions. The book does not include garment patterns, it explains how to knit different stitches by hand and machine, and why some stitches are more suitable for hand and others for machine knitting. i have just received my pre-publication copy of ‘Translating between Hand and Machine Knitting’, it was waiting here on my arrival home from holiday. It’s a great welcome home present. My pre-publication copy just out of its wrapper. Here are some sample pages. A pre-publication glimpse of my new book, Translating between Hand and Machine Knitting. To be published by Crowood Press in summer 2018, this book is lavishly illustrated with clear step-by-step instructions on knitting techniques, stitch structures and fabric constructions. Unlike many other knitting books, this one explains why knit stitches behave in certain ways, and how to achieve effects using combinations of stitches. Each stitch construction is analysed and explained with diagrams and examples, for example tuck stitch (in hand knitting this is known as broiche stitch) is clearly illustrated so that the route of the yarn is tracked, and effects on vertically and horizontally adjoining stitches can be seen. Fabrics made with this stitch in both hand and machine knitting are illustrated, explained and compared and contrasted in both methods of knitting. The most suitable method is highlighted and pros and cons of methods discussed. The constructions of textural and colour effects are explored and described by hand and machine knitting methods. There is a whole chapter explaining how to knit a hand knitting garment pattern on a machine, or vice versa, and how to subsitute yarns between both methods. Examples and illustrations support every step, and shortcuts and hints and tips are scattered strategically throughout the text. I am proud to say that my book has been written with the primary aim to enable the reader to take control of their knitting and create exactly what they want in both knitted textiles and knitted garment shapes. Find out how to work this, and many other useful and creative techniques in, ‘Translating Between Hand and Machine Knitting’, available next year. Time to play now that my manuscript has gone to the publishers. Yes there are lots of these at the University where I work, but this is my own. It needs a little TLC, and a new sponge bar, but otherwise a nice machine. I like these because they have a smooth action due to the rollers in the carriage. I am looking forward to setting it up and restoring it to its glory. Making up knitwear can be quite a chore, and using a linker makes it a lot quicker. Linkers make a chain stitch, which is extensible so will not burst the seam when the fabric is stretched. Domestic linkers can be operated by hand or have a motor. The most common make in the UK is the Hague linker, which is blue, and made in the UK by Hague. It can used on a table, or mounted on its own stand. When joining large pieces whilst working a table you have to be careful that the pieces don’t drag as the dial revolves as this is likely to effect the stitch formation and make the machine heavy to use. Using a stand means that larger pieces can hang down and revolve with the dial. Hague type linkers make the stitch on the outside of the dial where the needle is positioned, and the chain on the inside where the looper is situated. A linker is a usually circular, and has a dial of spikes radiating outwards. These are called ‘points’ and as with a knitting machine, the number of points per inch is used to describe the gauge of the linker. Linkers have large eyed, usually curved, needles and are designed to be used with a similar weight yarn to that in which the garment has been knitted, e.g. a linker with 5 points to the inch will take yarn of similar diameter/count to that used on a domestic knitting machine. The linker in this video has more points per inch than one intended for use with domestic machines; it is probably a 10-12 point model. Obviously its not possible to have a linker for each of your different machines, or for hand knits, but the good news is that you can use a linker for different gauges of knitting. If the stitches are wider spaced than the points, spread them out so that not every point has a stitch; the chain will carry over the odd empty point. If the stitches are closer together than the points, it is a little more difficult as you have to double them up on the points, and to frequent doubling can lead to a gathered seam, so I wouldn’t recommend using a domestic linker for finer than 8gge knitting. Before starting, hold the knitting up to the dial (remember that the circumference of the dial is smaller at the inner end of the points, where the stitches are made), and estimate how often you need to add a space, or double-up on a point. Make a note of this, and put the stitches up onto the points with evenly spaced gaps or double stitches. If the garment is knitted in a fancy of fluffy yarn, I recommend linking with a smooth, strong yarn of a suitably matching colour instead. The tension of the chain stitch can be adjusted with a thumb screw, and it is important to use this adjustment to achieve successful linking. Put broadly, over-large and/or missing loops indicate loose tension, and skipping, dragging and stiff operation indicates too tight, but the only way to get it right is to practise on scraps of knitting prior to sewing the garment. In very rare circumstances the timing of needle and looper can become disrupted, and it is impossible to get the linker to make stitches; the needle may break or bang into the looper, or the looper may be totally out of synch with the needle thrust. Although it is possible to adjust this yourself, unless you are very experienced with the machine and understand how the stitches are formed, I recommend sending the linker to Hague for repair. When preparing knitting for point-to-point linking the last row of main yarn knitting is not bound off; the stitches are left ‘live’. Before removing the knitting from the machine, 10-20 rows of ‘waste’ yarn are knitted, then the piece is knocked off the machine without binding off. When choosing ‘waste’ yarn, aim for a strong colour contrast in a yarn that is slightly thicker than the main yarn. A thicker yarn will open the last row of stitches, making it easier to insert the points, and a contrast colour helps the operator pick the correct row of stitches to catch onto the points. Try to choose smooth waste yarns; fluffy ones may leave contrast colour fibres when the waste is removed. See ‘Preparing your knitting’ for how to work the joining rows between main and waste yarn to facilitate easy linking. Before starting to put the collar and garment on the linker, check whether your linker makes the stitches inside or outside the dial, and position the piecs accordingly. In my example, the stitches are on the outside, the loops inside. Put the open stitches of the inner edge of the collar onto the points as described in the video, (wrong side facing in this example), and then put the garment neck onto the points (right side facing the operator in this example). Finally fold the collar over the top of the garment neck edge, and catch the open stitches onto the points – make sure to align the inner and outer stitches so that the collar is not twisted. Sew through the three layers, and pull the end back through the last chain to secure the linking. Remove the garment and unravel the waste yarn back to the main stitches. Take care on the last row, and if any stitches have been missed, catch them with a pin or a strand of waste yarn. I find those little safety-pin stitch markers very useful for this on domestic- machine knits.